“Shining Strong, Shining Bright” with CSNDC project manager, David Queeley (left) and public artist, Alexander Golob. Detail of the panel from inside the building. 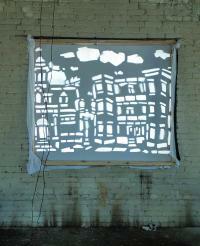 The bright, dynamic five panel light-art installation by Alexander Golob fills the windows of a now-vacant industrial building on 18 New England Ave. It will be on display until this summer. Each panel—portraying the equity-related impacts of climate change—features themes of cherishing nature and celebrates the diverse community that is Codman Square. The smallest panel is a leaf and the largest is a traditional three-decker house. “Since I was brought into this project after a great deal of thought was already put into this affordable, ecofriendly, and transit-oriented development, I saw myself as a facilitator for a vision of extending the vibrancy of the neighborhood into what are currently abandoned buildings and empty lots,” said Golob. Golob Art and Codman Square NDC thought that the lighting would be the most powerful way to make the street more welcoming. They also wanted the community’s help in deciding the imagery the artwork would portray. They were most inspired by the children who helped brainstorm the panel ideas for this project. The studio works with several non-profits, but this is the first time Golob Art has partnered with Codman Square NDC. Together, they have been working on this project since last summer and the art was installed throughout the holiday season. For further information on Golob Art, visit alexandergolob.com. To keep up with the work of Codman Square NDC, visit csndc.com.